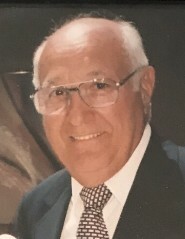 Anthony Ilacqua, 94, of Toms River, formerly of Maplewood, passed away peacefully at his home surrounded by his family on March 27, 2019. Anthony is a US Army Veteran, serving during WWII. During his service, Anthony was a medic and cook and serviced under General Patton in the 3rd Army, where he went through the American European Theatre. Anthony was proud to have served his country. He worked many years as a carpenter for the Local 253 in Newark before retiring. Anthony and his wife enjoyed ballroom dancing and were active in the Elks Club and the Holiday City Community. Beloved husband of 70 years to Margaret (Perillo) Ilacqua. Devoted father of Frank Ilacqua, his wife Diane, Valerie Glennon and her husband Thomas. Cherished grandfather of Anthony, his wife Colleen, Frank and his wife Fabiane. Proud great-grandfather of Riley, Dominick, Olivia and Giuliana. Dear brother of Rose and Catherine. He is also survived by many loving nieces, nephews, family and friends. He is pre-deceased by his parents Frank and Pauline and his siblings Sam, Minnie and Peter. Visitation at the Leonardis Memorial Home, 210 Ridgedale Ave. Florham Park on Friday from 10:30-11:30am followed by the entombment and committal service at Gate of Heaven Cemetery in East Hanover at noon.